Look beyond the ratings to the descriptions. How do you pick a wine? Walk into your favorite wine store and you’re confronted with a vast array of choices. You could ask a knowledgeable clerk for a recommendation. Or you could look at the signs and shelf talkers—the small, informational cards in front of the wines. If you opt for the information cards, you’ll notice that many of these cards include rating information that can be used as a guide to rank the wines you’re considering. The most common wine rating system is the 100 Point Wine Scale. 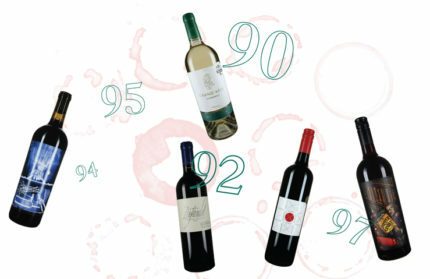 In the 100-point system, wines are assigned a rating from 0 to 100 by an experienced wine professional. In theory, the higher the number the better the wine, with 90 points and above considered ‘A’ grade wines. But that’s just part of the story—the reviewer’s description also provides a sense of what the wine tastes like. There are several publications that provide most of the ratings you’ll see. Let’s explore some of the best known publications and a sample of the wines they’re reviewing. The first and probably best known is Wine Advocate. Started as a newsletter by Robert Parker in 1978 to fill the information gap for consumers, Wine Advocate was the first to use a 100-point rating system. Generally, this source is a little more conservative, and therefore, the ratings are a little lower for any given wine. Here’s an example of a 90+-point wine. A wine that received 94 points from Wine Advocate in October 2016 is Bootleg Red Wine 2013 from Napa Valley ($34.99). Bootleg is embracing an unconstrained winemaking spirit in an attempt to redefine what makes a great wine. This blend contains seven different grape varieties. It’s a rich, full-bodied red wine with lovely black fruits on the nose and palate. If you’re looking for an intense yet smooth wine, this one’s for you. Enjoy it with any kind of red meat. The next most popular publication is Wine Spectator, known for slightly higher ratings than Wine Advocate. The staff of Wine Spectator review more than 15,000 wines each year in blind tastings. Many wines tasted are submitted to the magazine by wineries and importers from around the world, but the staff also purchase many wines on their own. Their tastings are conducted blind to help eliminate any subconscious biases. An example of a wine that Wine Spectator awarded 90 points is Seghesio Family Vineyards’ Zinfandel ($21.99). This wine is a mix of select batches of grapes harvested from different vineyards throughout Sonoma County and blended together by winemaker Ted Seghesio. Blending from the many diverse microclimates in Sonoma produces a wine that has a balanced structure of dark fruit, spice and tannins. Pair this wine with bolder flavors like grilled meats or strong cheeses. Next is the Wine Enthusiast magazine. Founded in 1979 as a mail order catalog for wine accessories, the magazine was launched in 1988 to provide more information to consumers. They have a reputation for giving higher scores than the other two magazines. A 90-point wine according to Wine Enthusiast is DFJ Vinhos Grand’Arte Alvarinho 2016 for just $12.99. Winemaker José Neiva Correia began in the wine business more than 35 years ago. He invented a system that disinfects corks to prevent TCA contamination that he sold to the largest cork manufacturer in the world. TCA contamination is a somewhat common problem that overpowers the wine’s flavor and makes a wine smell like damp cardboard. This white wine from Portugal delivers bright fruit flavors of apricot and plum. The rich, smooth mouthfeel is balanced by a beautiful crisp finish. You can best enjoy this wine with seafood or chicken. Another popular source for wine ratings is Vinous.com. The site was founded in 2013 by Antonio Galloni, the one-time lead reviewer for the Wine Advocate. The ratings of this website tend to be about the same as Wine Advocate. Their philosophy is that the written review is just as important as the score. A wine that scored 91 points on Vinous.com is Andrew Hardy Little Ox Shiraz 2014 ($18.99). This wine is made by winemaker Andrew “Ox” Hardy from vines that date back to 1891 from a small vineyard in the McLaren Vale in Australia. It’s a big, ripe, dry wine with lots of dark fruit flavors and a fruity, slightly sweet finish. This wine can be served with steak or other red meat. Finally we have another website, JamesSuckling.com. Suckling was a senior editor and European bureau chief for nearly 30 years at Wine Spectator. He launched the website because he believed the wine world needed a more modern approach to delivering information. He and his team review thousands of wines each year and tend to be in the middle of the pack with their scores. A wine they rated at 90 points is Bonny Doon Vineyard’s A Proper Claret 2014 at only $10.99. Named claret, which is the British term for Bordeaux reds, this is a fuller bodied version of those classic blends but not as rich and sweet as some from California. Look for the dark red fruit flavors and spice from the cabernet sauvignon, filled in by the petit verdot that nearly shares equal billing. Pair it with lamb or smoked duck. As you can see the scores are helpful, but the reviews can provide additional information to help match a wine with your preferences. So, feel free to rely on the information on the shelf talkers, available online, or talk with your local wine specialist for more recommendations. What started as a hobby is now a career. Fred Naddeo began his wine journey more than 20 years ago when his wife bought a bottle of Black Tower Riesling to try something different. It marked the beginning of an exploration of the amazing world of wine that continues to this day. Fred is a wine specialist at the Springfield Fine Wine & Good Spirits store on Baltimore Pike. Learn more at FineWineAndGoodSpirits.com.